Welcome to another installment of WHAT'S ON NETFLIX?, where we pick out a film currently playing on Netflix and review it for the fans. 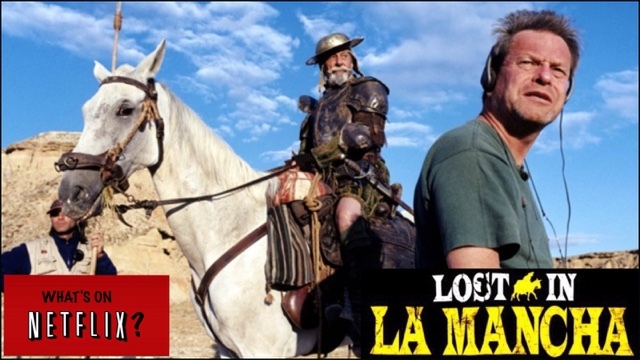 This week's selection is the documentary...LOST IN LA MANCHA. How far would you be willing to go to bring your dreams to life? What happens when an unstoppable creative force meets immovable financial or circumstantial obstacles? What's the difference between an avant-guard genius and a fool who's in over his head? These are the questions that Lost in La Mancha seeks to examine, in a brutally honest look at the failed attempt by director, Terry Gilliam, to bring his adaptation of the classic Spanish novel, Don Quixote, to life. And while Gilliam, at this time, had shining achievements like Brazil, 12 Monkeys, and Fear & Loathing in Las Vegas under his belt, circumstances that were often beyond his control eventually led to the downfall of the project, leaving nothing but a scant few minutes of shot film; elaborate costumes, sets, and props; and the storyboards. Lost in La Mancha was a project that originally began as a behind-the-scenes documentary like the ones you'd find on a DVD nowadays. As the project began to collapse, though, it became something else entirely. It begins very typically, with Gilliam passively shepherding the viewer through the early stages of pre-production on his film, which was titled The Man Who Killed Don Quixote. This film would be a reinterpretation, with the film following a modern day advertising executive played by Johnny Depp who steps back in time and finds himself in the Don Quixote story. Like Gilliam's other films, it would have been a film filled with imagination, surreal imagery, and a dreamlike atmosphere that blurred the lines between reality and fantasy. It also was to be quite an expensive film. Early in the film, we're introduced to Gilliam's financial hurdles. In the documentary, it's mentioned, both by Gilliam and by his producers, that the film is being entirely funded in Europe, as talks between Gilliam and Hollywood studios broke down due to Gilliam's reputation for lavishly spending for his productions. But Europe, unlike Hollywood, isn't traditionally known for spending much on film productions without American investment, resulting in Gilliam having a budget half the size that he would need to film his script. Probably the saddest part of it all is that it really wasn't a comedy of errors. Many of the issues that plagued the production ended up being less the result of negligence on the filmmaker's part and more just incredibly bad luck. Murphy's Law is in full effect, as everything that could go wrong does go wrong. Gilliam at first has trouble locking down some of the actors into a final contract for the film. Then, when cameras finally start rolling, they are unlucky enough to start filming just before an unprecedented storm comes through and floods the canyons and mountains the crew is supposed to be filming in. Add in issues with inadequate facilities, financing trouble, actors being injured, and crew members leaving, and you have a troubled production that few could have worked around. It's a documentary that perfectly illustrates how hard it is to make a film, especially a good one. It also perfectly shows off the kind of eccentric and brilliant mind of someone like Terry Gilliam. It's a film that is actually also quite an effective character study of Gilliam himself. Throughout the film, his enthusiasm and his energy when working with actors or set/costume designers or producers is palpable, and you can tell he has this vivid and vibrant vision for this film. Often, throughout the film, Gilliam is compared to Quixote himself, and in many ways, it's an apt comparison; the wild dreamer desperate to, against all odds, make the visions in his head come to life. The film would remain unfinished. At the end, the producer is asked about the status of the production. He responded, "abandoned." By the end of production in late 2000, Gilliam's script would fall into development hell as he struggled through legal trouble, financial difficulties, and eventually having to recast the film entirely. Even now, 16 years after production halted and in pre-production since 1998, Gilliam is still trying to complete the film. When last we heard about the production, it was early this year when Gilliam announced that he had received financing for the film. At this point, however, the film has been drastically reworked, with a new script, new cast, and new idea. Whether or not this version will ever see the light of day, what we do know is that the version we see in Lost in La Mancha will likely never truly see the light of day, and this documentary does a tremendous job showing the trials and tribulations that go into making dreams a reality. I would highly recommend this film if you are interested in film history, the works of Terry Gilliam, and seeing what could have been. Labels: Johnny Depp, Lost In La Mancha, Movie Reviews, Terry Gilliam, What's On Netflix?